A month earlier than usual, the premiere of the Sixth Season of American Horror Story is a little less than 4 hours away. I’m so excited and a bit scared to see what Ryan Murphy has cooked up for us this season. If you’ve been following the mysterious teasers and from the question mark in the title, we have no clue what the theme for this season will be! There’s been some talk and one semi-plausible unintentional spoiler. But rest assured I will not be revealing any hearsay. I for one hate spoilers so you will not be getting any surprises here, all spoilers will be truthful and fully forewarned. So, for tonight I’m making a Special Dinner to celebrate. 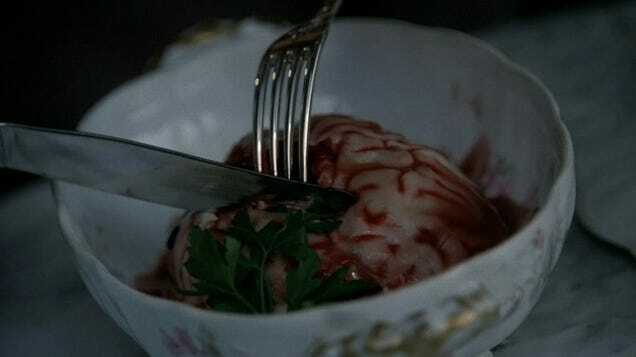 Unfortunately the only foods I could really think about that goes along with American Horror Story is the Brain Moira gives to Vivien during her pregnancy in Season 1, the uh, special soup that Madame LaLaurie serves to the witches during Season 4 and of course Devil’s Night in Season 5. So tonight I decided to make things that kind of seem Devilish. First off, I’m a little annoyed since I couldn’t find candles at the store which would really bring the whole ambiance together. But that’ll just have to wait until Halloween. I’m creating a special Ginger Ale Cocktail in honor of Devil’s Night. I’ll be putting Ginger Ale, Strawberries and Green Dye into a punch bowl for a nice Absinthe effect. Well, I better get back to cooking, Stan should be home any minute! if you can think of any foods I can make for another AHS Dinner Party. Check out a Photo from tonight’s dinner! Leaving the house this evening and rain had started to fall but was under a tree so drops had not hit the ground. I didn’t fell any wet raindrops but heard them hitting the leaves. Fearfully I looked to see if teeth were falling.